The bacon has been cured and dried in the refrigerator for a couple of days. It is ready to eat at this point or smoked. I cold smoke my bacon which means that little heat gets to it as I do not want to cook it but flavor it with hickory smoke. There are many types of smokers on the market but we like to things as inexpensively as possible so we used a barrel placed over a hole that had a trench running from it to a fire pit dug in the ground. A fire of charcoal and hickory was started in the pit, covered with a sheet of metal (offset for air to feed the fire), we laid plywood over the trench and then covered it with dirt. 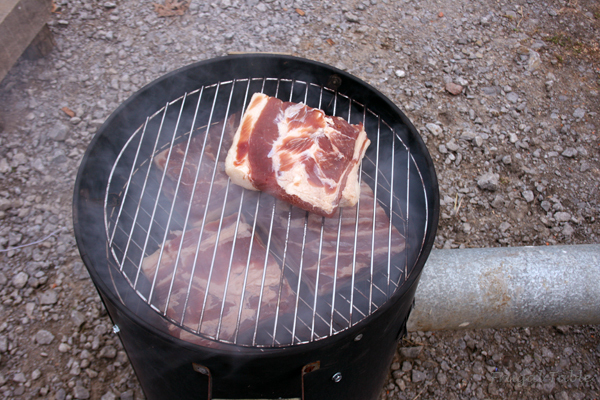 The smoke would travel from the pit to the barrel and smoke the bacon. We drilled holes in the barrel right below the top rim and ran a broom handle through it. From there we hung the bacon with wire from the broomstick and covered the barrel with another piece of plywood. It worked really well but was a lot of work digging the pits and trench. For this batch, we came across an old smoker and modified it. 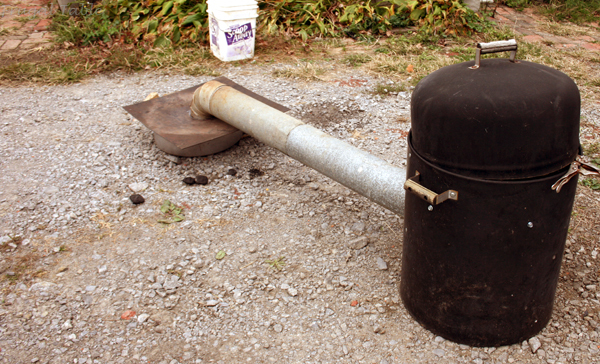 Boone cut out a hole and ran some woodstove pipe from the charcoal holder to the smoker body. Nothing fancy here as he took the door off to run the pipe into the smoker then duct taped around it. I wanted 3 racks and the smoker only held two so Boone just ran 4 sheet metal screws into so I could use a rack from our regular smoker. I first start a small amount of charcoal in a charcoal chimney. Into the charcoal pit of the smoker I put a handful of unlit charcoal briquettes, then the hot charcoal then some chunks of dry hickory and then a few that have been sitting in water. They will produce a good smoke, the hickory will catch fire and the unlit briquettes will eventually catch fire which means I do not have to check them very often. As long as smoke is coming out I leave it alone. After about an hour I flip the bacon. I only smoke the bacon for about 3 hours. Then I bring it in for a rinse, pat dry then wrap in plastic wrap, freezer paper and finally into a labeled freezer bag. 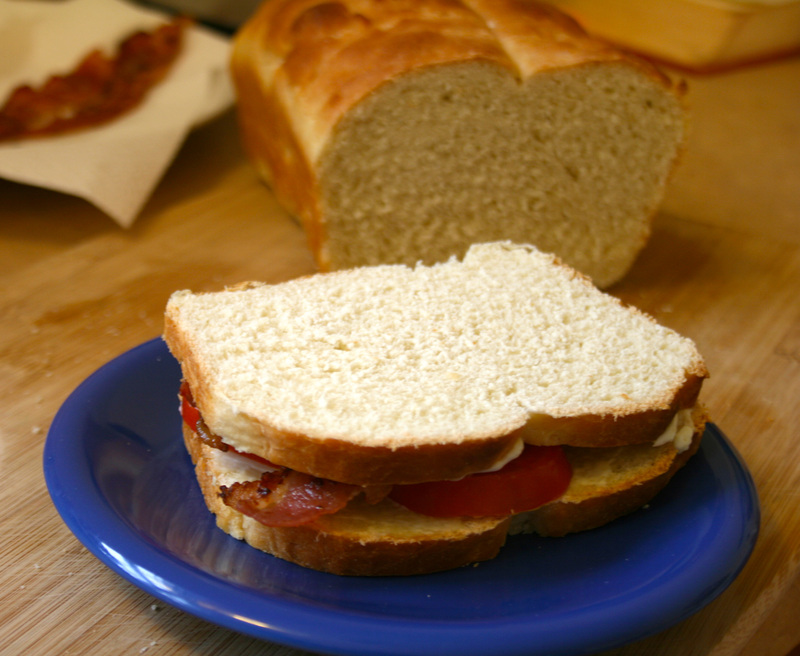 Oh, I will probably go ahead and slice some so I can have my favorite sandwich – a BLT on my favorite Buttermilk Bread. So good!